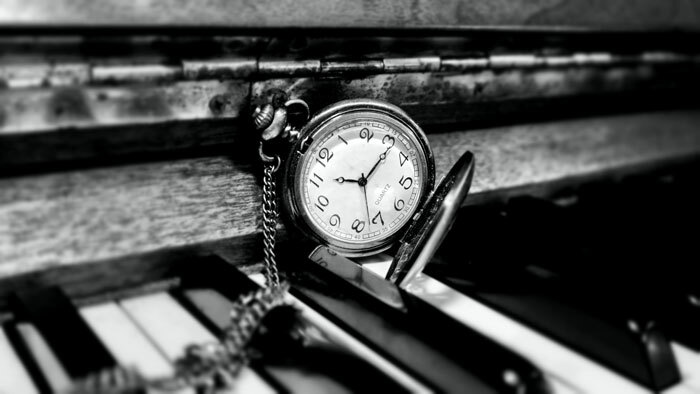 How Long Do Digital Pianos Last? In this guide, we’ll be going over all the important things you should know before buying a digital piano or keyboard. 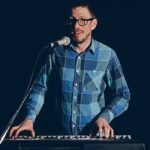 Although I do believe that no digital piano is perfect, this guide will help you better understand how to pick the instrument that’s right for YOU and narrow down your choice to 1-2 models that suit you the best. Oftentimes people don’t do proper research and choose the product that has the most reviews on Amazon. While this may work with some products, digital pianos aren’t one of them. The reason is that digital pianos themselves are pretty complicated, and there are a lot of important factors you need to consider to ensure you’re making the right decision. First of all, you probably want to know how are digital pianos different from acoustic pianos and why you might prefer one over the other. “How do digital pianos work?“, you may aks. When it comes to digital pianos, the main challenge engineers face is to accurately reproduce two things: the sound and the feel of an acoustic piano. Both tasks are pretty tough as there’s just too much going in this fabulous instrument. 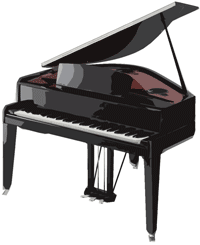 Strings, hammers, and keys are the parts that actually produce the sound in an acoustic piano. When you press a key, a hammer attached to it strikes a corresponding string, which vibrates and makes a sound. Digital pianos don’t have strings, and hammers are used only to add extra weight to the keys and recreate the mechanical movement found in a traditional instrument. To reproduce the sound of an acoustic piano and other musical instruments, digital pianos use samples. Samples are a precisely recorded sound of a real instrument, usually at different dynamic levels. The higher the quality of the samples and digital technologies used to create (record) them, the more realistic and accurate the sound. In fact, in the past several years the technology has become so sophisticated that high-end digital pianos provide the sound almost indistinguishable from a real piano. When it comes to major brands, the recording process usually looks like this. There is a professional recording studio where they put a perfectly tuned acoustic grand piano and using a few dozen high-quality microphones record each note played at different volumes. So if the process is roughly the same why not all digital pianos sound the same? Well, there’re still a lot of things that different manufacturers do differently. 1) What acoustic piano (not necessarily grand piano) was used to record the sound. 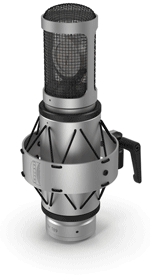 2) The recording process and technologies used in the studio. 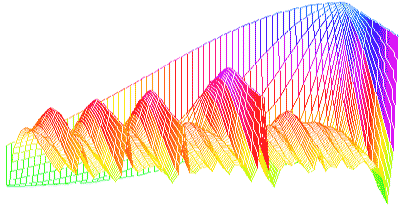 3) Post-processing and algorithms used to model complex tonal interactions such as string resonance, damper resonance, cabinet resonance, natural reverberation, etc. 4) The length of the samples and the amount of memory dedicated to them. Generally, more memory means higher-quality/longer samples can be stored in a digital piano. Cheaper models have less memory and manufacturers have to take a slightly different approach. Instead of recording each individual key of an acoustic piano they record every second or every third note and then stretch the samples using their modeling technologies to fill in the gaps. Another interesting technology that has been gaining popularity in the past few years is called Physical Modeling. Now, unlike sampling, which implies recording the sound of an acoustic piano at different velocities, physical modeling basically recreates the piano sound from scratch. It uses various modeling techniques and advanced software to recreate the physical behavior of the acoustic instrument where hundreds of elements interact with each other, making up the ultimate “imperfect” sound that we hear as we play. While sampling remains the most popular technology used in digital pianos today, you’ll hardly find a digital piano that doesn’t use some kind of modeling on top of the samples (e.g., for string resonance, damper resonance, etc.) to further improve the sound and make it more natural. There’re also some digital pianos that use purely modeled piano sound and no samples at all. For example, most Roland high-end digital pianos today come with the SuperNATURAL Piano Modeling sound generator that only uses physical modeling to produce the sound. There’re also various VST (Virtual Studio Technology) plugins that provide piano modeled sounds and effects. There’s a lot of debate today on which technology produces a more accurate and natural sound, but let’s leave it for another article. I’ll only say that both technologies have their pros and cons and ultimately, it’s probably a mixture of both that will yield the best results. Now that you know how digital pianos work compared to acoustic pianos, let’s look at the pros and cons of digital pianos. The difference between a digital piano and a keyboard often causes a lot of confusion. In fact, people often use these terms interchangeably without realizing that these are two quite different things. And while every portable digital piano can simply be called a keyboard, not every keyboard can be called a digital piano. The main difference lies in the purpose of these instruments. And depending on your needs and experience you might prefer one over the other. These days digital pianos come in all shapes, sizes, and forms you can imagine but what unites them is their main purpose. A digital piano is designed to mimic the feel and sound of an acoustic piano as closely as possible. The first thing you’ll notice is that all digital pianos come with a full set of 88 fully-weighted hammer-action keys. And it’s the most obvious distinction from keyboards, which most commonly have 76 or 61 non-weighted or semi-weighted keys. Another important aspect is the sound. Digital pianos rarely have more than 20-30 built-in sounds, and their main priority is to provide a full, natural piano sound. It’s achieved by using high-quality samples of a real concert grand piano recorded at different volume levels as well sophisticated modeling technologies to simulate organic elements of piano sound such as sympathetic resonance, damper resonance, key-off effect, etc. Digital pianos are usually very straightforward instruments and mainly used as an alternative to acoustic pianos. 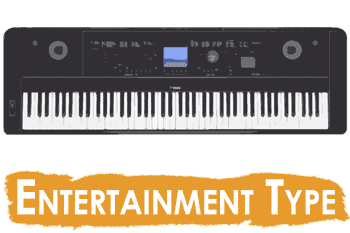 Generally, you won’t find hundreds of built-in sounds, songs, accompaniment styles, and interactive features on a digital piano unless it’s an “entertainment” type digital piano, which we’ll get to in a bit. While a keyboard is literally keyboard – a set of keys, here, we’re talking about a keyboard as a musical instrument. Just like digital pianos, there are different types of digital keyboards. There are portable keyboards, arranger keyboards, synthesizers, keyboard workstations, MIDI-controllers, etc. But the lines have been blurred, and today many instruments combine features of arranger keyboards, workstations, and synthesizers. All these keyboard types, except for portable one, are mainly professional instruments that often cost > $1000 and designed for composers, singers, music producers and other musicians. Let’s quickly look at each type. Portable keyboards (a.k.a. 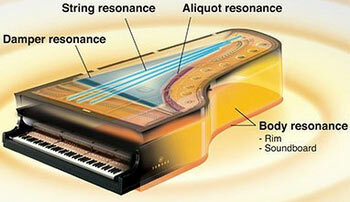 portable arrangers) are instruments that are most often confused with digital pianos. Usually, a portable keyboard is the first thing beginners consider as their first instrument to start learning piano. The main reason behind is a very cheap price. For a beginner who is not 100% committed to playing for years, it’s a very appealing option since it doesn’t put a person at risk of overspending before they know whether they’ll stick with it or not. The trade-off of this approach is that you won’t be able to fully understand and experience how it is like to play the piano because portable keyboards hardly provide a sufficient level of realism in terms of sound and especially key action. A typical portable keyboard cost anywhere from $100 to $300 and come with 76, 73, or 61 semi-weighted or non-weighted keys. Unlike fully-weighted action found on a digital piano, semi-weighted action doesn’t use hammers to recreate the feel of an acoustic piano. Instead, it uses a spring-loaded mechanism, which although add some resistance to the keys, feels light, unrealistic and really nothing compared to the real thing. But there’re also a few other advantages of portable keyboards, aside from their price. First of all, as you can tell from their name, they are very portable. Most of these keyboards are only 10-15 lbs so you can drag them around very easily. You can easily put them on a table and take away in storage when not in use. The second advantage of portable keyboards is all the extra features and functions that come with them. Most portable keyboards are literally loaded with hundreds of sounds, songs, rhythms, and other so-called bells and whistles. And while I prefer quality over quantity, and many of the built-in tones sound plasticy and unrealistic, it’s definitely a plus for those who want to explore various instruments and styles and have fun with interactive features and modes. That’s why a portable keyboard is a very popular choice for kids. But as I said it all comes down to your personal needs and the goal you’re trying to accomplish. 1) You have a very limited budget and can’t afford a digital piano ($350+), even the most basic one. The comparison table below sums up the main differences between a digital piano and a portable keyboard. Modern acoustic pianos have 88 keys. Most keyboards have 88, 76, or 61 keys. 2) Semi-weighted - common for budget portable keyboards (usually cost <300$). Spring-loaded mechanizm adds more resistance to the keys compared to the non-weighted action. 3) Fully-weighted (hammer action) is designed to replicate the action of a real piano. It uses small hammers (rather than springs) attached to each key to recreate the mechanical movements found inside an acoustic piano. Difference in volume between the loudest possible note and the softest one. A synthesizer is an electronic keyboard that can generate or copy a wide variety of sounds and is commonly used in music production. Synths allow you to create virtually any kind of sound you can imagine including sounds of other instruments, a voice, a wind, a burst, a siren, a car, the list can go on forever. Well, synthesizers come with a set of basic waveforms and pre-recorded sounds, which you can mix together as well as alter the sound’s attack, sustain, decay, and release time, add filters to get the exact sound you need. Arrangers are primarily designed for professional performers and provide a wide variety of backing tracks (chord and rhythm patterns) that will match the style, rhythm, and tempo of whatever you’re playing. This allows composers and songwriters to quickly and easily create an accompaniment for a song without having to call in musicians to play all instruments live. Sometimes lower-end arranges are called “portable arrangers”, which is basically the same thing as “portable keyboards” we talked about. A keyboard workstation is like a computer built into a keyboard. Workstations combine a wide range of tools and allow users to perform a wide variety of tasks including sound synthesis, sequencing, audio recording, working with sound effects/filters, etc. They usually come with hundreds if not thousands top-notch sound samples, which can be customized by using knobs and sliders that allow you to control various sound parameters on the fly. A MIDI-controller is simply a device that generates and transmits MIDI data to other electronic devices that can interpret that data and trigger sounds or control sound parameters accordingly. A typical MIDI-controller is a piano-style keyboard that is connected to a computer and sends MIDI data to it via USB or MIDI ports. MIDI-controllers usually can’t produce sound on their own, all they do is track your key presses (velocity, length, pressure) and send this data (MIDI) to music making software (Kontakt Libraries, Virtual Instruments VSTi) running on your computer which generates the sound. Most MIDI-controllers have non-weighted keys and are designed to generate multi-layered electronic sounds. There are MIDI controllers that target piano players like the Kawai VPC1, which has the incredibly realistic RM3II Wooden-key, Graded-hammer Action and can be used with piano VSTs like Synthogy Ivory II , Spectrasonics, etc. Any digital piano that has a USB type B port or MIDI In/Out ports can be used as a MIDI-controller. As I mentioned, digital pianos aim to reproduce the feel and sound of an acoustic piano as close as possible. But not all digital pianos are created equal. There’re several types of digital pianos, and each has its pros and cons. So let’s go over each type and define their main features and usage scenarios. Portable digital pianos are also known as digital slab pianos. This is probably the most popular type of digital pianos. Tthe biggest advantage of these instruments comes from their design. They don’t come with a base (stand) of any kind and just like portable keyboards can be easily moved around and stored when not in use. 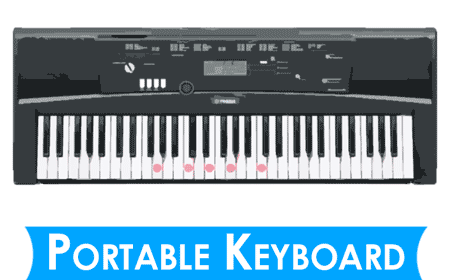 The main difference from portable keyboards is that portable digital pianos have a full range of 88 hammer-action keys, just like an acoustic piano. The sound quality is also much superior due to higher quality samples, higher polyphony number and wider dynamic range (from the softest pianissimo to the loudest fortissimo). Price is another reason why portable pianos are so popular. Generally, a console type digital piano with the same characteristics (action, sound engine, polyphony) is always 200-300$ more expensive than a portable one. At the same time, it’s important to remember that you’ll probably want to buy a stand for your portable piano, which can cost you an extra $30-$100 depending on the design (see Accessories section). 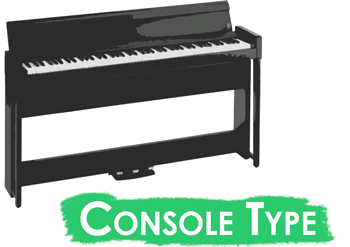 Console type is the second most popular type of digital pianos. Console digital pianos come closest to an acoustic piano in all the main aspects including sound, keyboard feel, and look. What makes them different from their portable counterparts is that they come with a furniture-style cabinet and 3 pedals resembling the feel and look of an acoustic piano. There are several things (good and bad) that come from the console design. First and foremost, you get a full-featured instrument that comes with everything you need to experience an authentic playing experience right away. You don’t need to buy a stand or pedals additionally. Thanks to the elegant acoustic-like design, a console digital piano will serve not only as an instrument for playing but also as a nice piece of furniture for your home. And here comes the main disadvantages of console pianos: size and weight. Most console pianos weight from 70 to 150 lbs and are meant to be kept in one place. Yes, you can still move them around much easier than traditional pianos, but they simply aren’t designed to be carried around a lot. So keep that in mind. The price of console digital pianos differs a lot starting from $700 and going up to $3000 and even more. It’s hugely depends on how close a digital piano gets to an acoustic instrument. As the price goes up, so does the quality of action, sound samples, and speaker system as well as other elements that make the playing experience more authentic. Upright type is a sub-type of console pianos, which looks and feels almost identical to an acoustic piano. 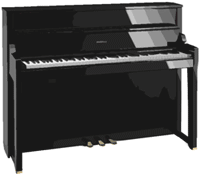 Upright digital pianos closely resemble an acoustic piano starting from the upright design and ending with a sophisticated hammer action, wooden keys, and multi-speaker sound system. It’s the most realistic and, for that reason, very expensive type of digital pianos. 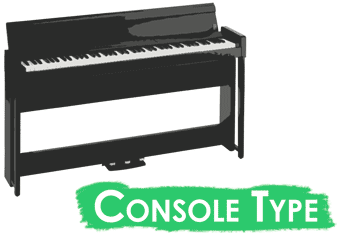 It’s the least common type and the most expensive type of digital pianos. Most digital grand pianos cost more than new acoustic pianos. They usually feature sophisticated multi-speaker sound system with extremely detailed and rich sound as well as meticulously engineered hammer system almost indistinguishable from a real grand piano. Prices start at $1500 for the most crappy ones (from Williams, Suzuki) and go up to a whopping $15 000f for brands like Yamaha or Kawai. Formally, there’s no such type of pianos, but I decided to identify them as a separate type. Here is what I mean by “multi-purpose“. Unlike regular portable and console digital pianos, multi-purpose pianos come with a whole world of sounds, rhythms, songs, learning features and recording options. And this kind of makes them similar to portable keyboards. BUT, what makes them different is that in addition to all those extra features, they have a realistic piano sound and 88 hammer-action keys. You can use such pianos not only for piano playing but also for non-professional music production, composing, learning and just for fun. Stage pianos are designed with live performances in mind. They are not intended to resemble the look of an acoustic piano but rather to be a compact travel-friendly alternative to use on stage or in a studio. The feature that put stage pianos away from other types is that they usually don’t have built-in speakers/amplifiers. That’s because stage pianos are meant to be used with an external amplifier or PA system. In reality, 76 keys are enough to play most modern pieces. Some advanced (classical) pieces require a full set of 88 keys. 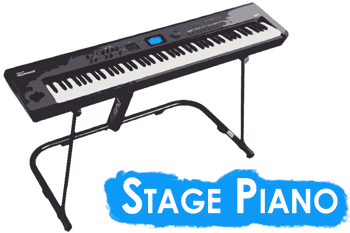 The prices ranges are specified according to prices on digital pianos only from major brands like Yamaha, Casio, Roland, etc. Instruments from less-known cheaper brands have lower prices but I don't recommend them. These are giants in the world of digital musical instruments. They have proven to be reliable brands that provide the best technology in the industry that for now other brands can’t offer. Buying a digital piano from one those 5 brands will save you time and headaches of dealing with less known brands starting from poor build quality and ending with unrealistic sound and feel of the instrument. Well, of course, this may not always be the case. But do you want to take that chance? There are many more of them, but these are the most popular ones. Digital pianos from these manufacturers are usually good looking and very affordable, but the realism of sound and key action leaves a lot to be desired. Note: Please read our full Digital Piano Brands Guide to learn more about brands that we recommend and don’t recommend as well as their product lines and popular models. The difference between the actions come from the type of mechanism they use. This, in turn, determines how much force is needed to press a key and how realistic the action compared to the feel of an acoustic piano keyboard. Depending on your needs and playing style one type may be more suited to your than the others. It’s the most lightweight action which is commonly found on organs, synthesizers, and entry-level keyboards. The synth action uses a basic spring-loaded mechanism. The keys are usually thin and small with a light plastic feel. The action may seem a bit uncomfortable for piano players as it’s just too quick and lacks resistance. At the same time, for some types of music (other than the piano) synth action is preferred for its playability and fast response required for playing synth leads, organ tunes, etc. Nowadays a semi-weighted key action is much more common for beginner keyboards than a non-weighted one. It’s a middle ground between synth action and fully-weighted action and perfect for those who don’t need/want a full resistance of a hammer action or who constantly switch between synths and pianos. 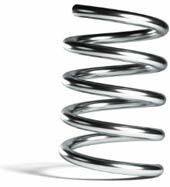 A semi-weighted action uses the same spring-loaded mechanism but compared to the synth action provides more resistance to the keys (by either using stiffer springs or additional weights). As a result, the keys return to their “up” position a bit slower. Still, the action is far from what you get on an acoustic piano and is not recommended if you want to focus on piano playing. Lots of semi-weighted keyboards have blocked-end keys that look like regular piano keys and can be easily confused with hammer-action keys. Feels closer to an acoustic piano than a non-weighted action Can be hard to transition to an acoustic piano after playing it for a while. A hammer-action keyboard is designed to replicate the touch and feel of an acoustic piano. To achieve that manufacturers have added actual little hammers under each key to recreate the mechanical movement similar to a real piano. Not all hammer-action keyboards are created equal. A $500 entry-level piano and a $5000 high-end piano will both have hammer action keys. But those will be completely different actions with different feel and level of realism. As a general rul, the higher the price of the instrument the more sophisticated hammer system it uses. High-end models often have real wooden keys that have escapement mechanism and recreate every little aspect of an acoustic piano action, including the design of the hammers themselves. Also, the total length of each key (a key itself + the part you can’t see) is usually much longer compared to that of entry-level digital pianos. And it becomes more important as you get more advanced. 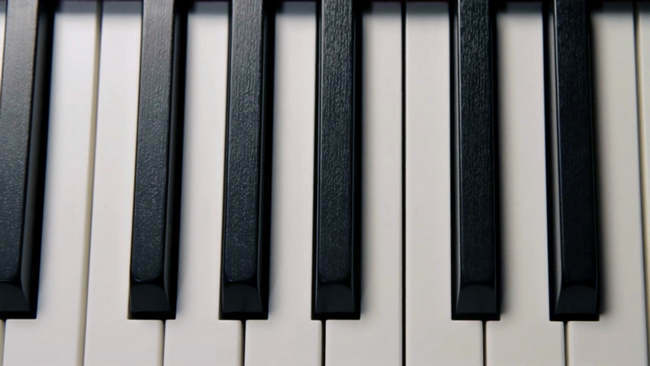 The longer the overall length of the key, the further back you can have the pivot point which makes it much easier to play the white keys up between the black ones. Most digital pianos have 88 full-size keys, which means the size and the number of keys are the same as found on an acoustic piano. Implies that the weight of the keys is slightly heavier in lower registers and become progressively lighter as you move up the keyboard, which is a characteristic of an acoustic piano keyboard. 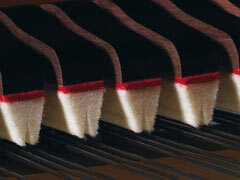 Higher-end digital pianos instead of conventional smooth keys have textured keys that simulate Ivory and Ebony. It gives a nicer and less slippery feel to the keys and helps absorb moisture from the player’s fingers. All digital pianos have touch-sensitive keys, which means the volume will change depending on how hard or soft you play the keys. Digital pianos usually have adjustable touch sensitivity, which allows you to adjust the sensitivity of the keys (in other words, with how much force a key needs to be struck to produce the loudest sound) to suit your playing preferences. Entry-level keyboards cheaper than $150 usually don’t respond to velocity. 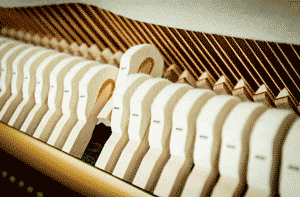 Sensors are used to detect the depth and velocity at which the keys are played. Most entry-level digital pianos (under $1000) use 2-sensor detection system. More expensive models add one additional sensor and use 3-sensor systems, which allows for faster note repetition by enabling the sound to be produced even when a key hasn’t fully returned to its resting position. In my opinion, the whole notion of sensors is a bit overhyped these days as there are more important elements that add to the realism of a keyboard action. In fact, I played many keyboards that had 2-sensor systems that felt more realistic and responsive than those with 3-sensor systems. The keys on both acoustic and digital pianos inevitably produce some amount of noise when you play them. So it’s not something to be worried about as long as it doesn’t affect your playing experience. 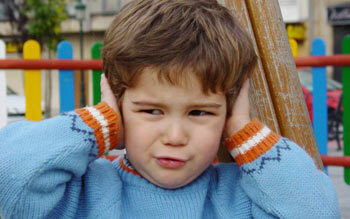 On acoustic pianos the noise is usually not audible at all due to high volume levels that the instrument produces. On digital pianos on low to medium volume levels, you might hear the keys hitting the bottom of the keybed or a little clicking noise, which is again not something to be concerned about. Some keyboard actions tend to be less noisy than others but it all comes down to a particular model. More expensive models usually have very quiet keyboard actions. The thing to remember is that all the keys should produce roughly the same amount of noise. If one or two keys are significantly louder than the others, it’s better to contact the manufacturer, especially if the noise bothers you. Not only digital pianos provide versatility and convenience that’s not available with acoustic pianos but they also come with a bunch of extra features that make playing and learning more enjoyable and fun. Some pianos allow you to change the conventional click sound of the metronome to various drum rhythms. You can also adjust the number of beats per measure, the tempo and the volume of the metronome. For an intermediate player it’s desireble to have 128 notes of polyphony or more. 1) Split – divides the keyboard into two parts, allowing you to play a different instrument sound in each of them. For example, you can play guitar with your left hand and piano with your right hand at the same time. 2) Dual (Layering) – allows you to layer two different sounds so that they sound simultaneously whenever you press a key. For example, you can layer strings with the piano sound or combine whatever sounds you like to get some new interesting sounds. 3) Duo (a.k.a. Duet Play, Partner Mode, Twin Piano) – devides the keyboard into two halves with identical pitch ranges (two middle Cs) allowing two people to play the same notes at the same time. Some digital pianos allows you to turn off the left or right hand part (track) of a song (built-in or downloaded from the Internet) and practice it while listening to the playback of the other part. MIDI-recording is not the recording of the actual sound of the instrument. Here, we’re recoding the MIDI data (a sequence of notes, their length, velocity and other parameters). Built-in Audio recorder will allow you to record the audio output of the instrument and save it to a flash drive usually in WAV format (Linear PCM, 16bit, 44.1 kHz, Stereo). You can then share your recording on social media, upload it to SoundCloud, burn to CD, etc. Audio recoding is much more universal than MIDI recording and allows you to get a CD-quality audio file playable on most modern devices. Accompaniment function will enrich your playing with a full backing band (rhythm, bass, harmony) making you performance a full-fledged song. In other words, you manage the “band” with your left hand (by specifying chords) and play the main melody with your right hand. Some instruments offer several accompaniment modes, and allow you specify chords using the full range of the keyboard. So, for example, if you know how to play a song in F major, you can transpose the pitch and play the song in C major without actually learning it in a new key. You can also transpose a song written in a difficult key (e.g., many black keys) into a different key with easier chords, hearing it as you were playing in the original key. You can use this function to match the piano’s pitch finely to that of other instruments or music (old piano, tape). The tone of an acoustic piano is quite complex and consists of many different elements. Depending on the model, digital pianos reproduce various nuances of an acoustic piano sound to get even closer to the sound of a real acoustic piano. When you depress the damper pedal on an acoustic piano, you can hear the sound continuously playing even when the keys are released. It does this by lifting the dampers from the strings so they can resonate freely until you release the pedal back up. Digital pianos don’t have strings but recreate this effect digitally. Some digital pianos also have a “half-pedal” feature which allows you to more precisely control the amount of sustain and thus be more expressive while playing. When you play an acoustic piano, the sound it produces is not only associated with the keys you play but also with other closely related strings that resonate sympathetically making the sound richer and smoother. It also removes the sense of notes being dry and separated from each other. Many digital piano today simulate this phenomenon pretty accurately. The sound of the dampers falling back on the strings varies depending on the speed at which the fingers leave the keys. 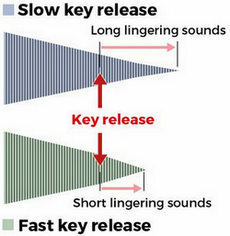 Key-off simulator adjusts the length of these sounds according to the key’s release speed. Some digital pianos offer Lid Simulation feature, which mimics the sound of a grand piano with the lid raised or lowered. While some of these elements are very subtle and aren’t easily noticeable, they do add to the overall realism of the playing experience. A wide variety of connectivity options is another important advantage of digital pianos and keyboards. I don’t have to tell you how much more you can achieve once you connect your piano to a computer or other devices that will make your performance better, smoother, and more creative. Also known as USB to Device port or USB drive port. 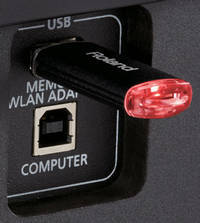 The port can used to plug in a flash drive into the piano to exchange files quickly and easily. For example, you can load MIDI songs into the piano’s internal memory for playback or rehearsal. Alternatively, you can play back WAV and MIDI files (depends on the isntrument) directly from the flash drive without loading them into the piano’s flash memory. And finally, you can save your own performances recorded with the instrument to the flash drive as well as load them back when needed. Also called USB to Host terminal. This jack can be used to connect a computer or a tablet (using special adapter) to exchange songs/files, and MIDI data. Today you probably won’t be able to find a digital piano or keyboard that doesn’t have a headphone jack. The jack allows you to plug in a pair of headphones and practice at any time of day and night without bothering anyone else. Sustain jack (a.k.a. damper jack) can be used to connect a sustain pedal to your instrument and use it in the same way as the sustain pedal of an acoustic piano. Line Out (a.k.a. Aux Out) jacks can be used to connect your digital piano to external sound systems such as amplifiers, PA systems, mixers, etc. Line In (R, L/Mono) jacks work in the opposite fashion to Line Out jacks. They can be used to connect an external audio device and listen to it through the onboard speakers of your digital piano/keyboard. Line In jacks aren’t normally found on digital pianos, but many professional keyboards have them. An audio in jack works in the same way as the Line In jacks but instead of two 1/4″ standard jacks (R, L/Mono) you get one 1/8” stereo jack. Audio In jacks are much more common on digital pianos and entry-level keyboards. 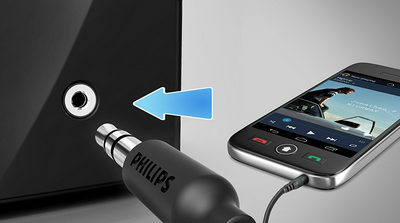 They allow you to easily connect your smart devices (smartphones, laptops, tablets) to your instrument using a 1/8” Male to Male cable and listen to them via your piano’s built-in speakers. One end of the cable goes to the headphone jack (Audio Out) of your device and the other one to the Audio In of your piano. 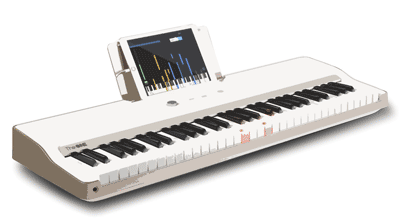 Some digital pianos in addition to USB MIDI connectivity support Bluetooth MIDI connection, which means you can exchange MIDI data with your smart devices wirelessly to control music making and teaching apps to enhance your playing and make it more fun. 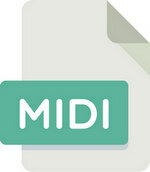 MIDI In/Out are traditional ports used to transfer MIDI data. Nowadays it has become more common for digital pianos to have USB ports and use them for that purpose. But some manufacturers prefer to stick with MIDI ports rather than modern USB ports. 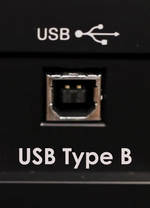 There is not much difference when you use them for computer connection, except USB A to B cables you’d use for USB connection are cheaper and more wide-spread than MIDI to USB adapters. Most professional keyboards still have MIDI ports to be compatible with older keyboards and transfer MIDI data to them (yes, you can send MIDI data not only to a computer but also other musical instruments). A Mic In jack which, as you may have guessed, can be used to connect a microphone directly to the keyboard and sing along with your performance or a song playback. The keyboard will output your vocals through the onboard speakers and sometimes will allow you to add some effects to it. 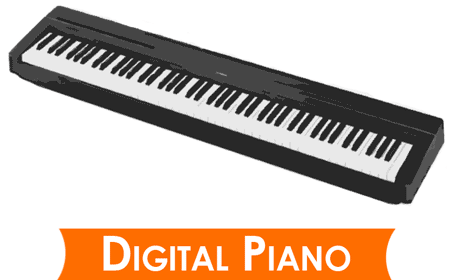 The digital piano market today is very active and still in its developing stage. New models (with new features and technologies) come out every year, bringing even more realistic piano playing experience. For that reason, a digital piano you bought, say, 10 years ago, will have a hard time competing with models introduced a few years ago. That’s why there’re probably very few people who would use a 20-year-old digital piano today. The technology available back then is much inferior to what you can get today for the same (or less) amount of money. And since digital pianos haven’t been around for that long, it’s kinda hard to tell what direction the industry will go and if that trend will continue. With that being said, for just $1000 today you can get a decent digital piano that sounds and feels pretty close to an upright piano and will not lose its actuality in the future. Does that mean you can buy a digital piano and use it for 30, 40, 50 years? I guess you can, but it’s quite unlikely. One reason is obsolescence we already talked about, and another one is mere wear and tear. 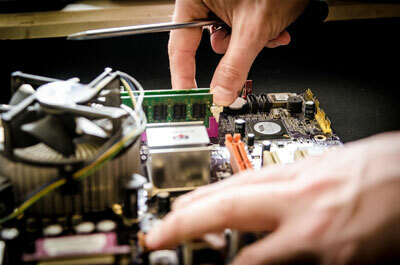 While digital pianos are electric instruments and have nearly not as many elements that can break or wear out compared to acoustic pianos, there will still be some mechanical wear and tear, and eventually, your digital piano might need a repair. This is especially true for a key action. Over time it can develop more noise (felts under the keys wear out, the keys will become clunkier and looser), which will make the playing experience much less enjoyable. How fast will that happen? Well, it depends. First of all, it will come down to the key action itself. It should come as no surprise that higher-end digital pianos with higher-quality more sophisticated action mechanism will serve for more years than a $300 keyboard. Another important thing is how often you use your digital piano. One thing is when you play it for an hour or two several times a week, and another is when you have a big family and piano is played every day for hours straight. Either way, by the time that happens there will probably be a lot of newer, better models available on the market, and the question is will you be willing to invest money into repair, which in some cases can be half as expensive as the piano itself, or is it easier to get a new model instead. Getting parts can also be very difficult, especially if your digital piano is 10+ years old. When it comes to acoustic pianos, the situation is a bit different because they tend to cost considerably more than digital pianos and “obsolescence” is not really a thing for them. So it makes much more sense to repair an acoustic piano than to repair a digital piano. There’re a number of accessories you may want to consider buying along with a digital piano. What those accessories will be depends on what you get with your digital piano out of the box and, of course, your personal needs. Nearly all console digital pianos come with an integral stand (cabinet) and 3 pedals, so you don’t need to spend extra money on that. 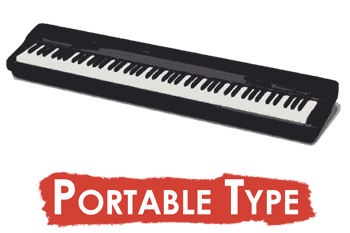 Most portable pianos don’t come with a stand of any kind, and only include a small plastic sustain pedal (footswitch). So with portables models, you’ll likely to spend more money on additional accessories than with console models. Honestly, when it comes to digital piano accessories, I don’t recommend buying those all-in-one bundles available on Amazon, as the accessories you get are usually very cheap and not of very good quality. It’s especially true for headphones. When it comes to stands, you basically have two options. One is to buy a portable Z- or X-type stand that are portable and easy to put in storage when not in use. Such stands are usually collapsible and adjustable, which makes them even more versatile. The price of X-type stands is usually $30 to $80. The second option is to buy a furniture-style stand that manufacturers often offer for particular models (usually portable ones). Such stands are sturdier than X-type stands and best suited for home use. 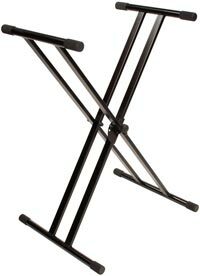 They’re quite easy to move around, but you probably wouldn’t use them for gigs as they’re still not as portable as X-style stands. The price of furniture-style stands can be as much as $100. 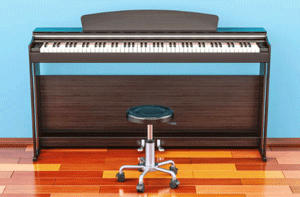 When it comes to piano pedals, there’re three options that you may want to consider. 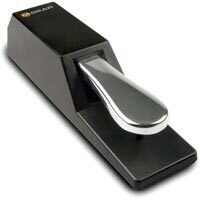 The first one, is to use the sustain pedal that comes with your instrument. Most entry-level digital pianos come with one of those flimsy plastic footswitches that don’t look or feel anything like an acoustic piano pedal. But it still does its job, and for a beginner, it would probably be a satisfactory solution. On the other hand, if you’re a more experienced player and want a more substantial and realistic sustain pedal you may want to consider a piano-style chrome pedal that feels and looks similar to a real piano pedal. Luckily they aren’t very expensive, and I always recommend checking the M-Audio SP-2 out, which has proven to be a high-quality sustain pedal that will work with any digital piano or keyboard that has a sustain jack (pretty much all of them have). Those who don’t just need a sustain pedal (the most used pedal), but all three pedals found on an acoustic piano (sustain, soft and sostenuto) should take a look at 3-pedal units that some manufacturers offer for their portable pianos. Usually, those 3-pedal units are designed to be fastened to furniture-style stands. So it would be a good idea to buy them bundled together (if available) to save some money. Choosing a good pair of headphones for your digital pianos is probably as important as choosing a digital piano itself, especially if you’re going to be spending a lot of time using them. 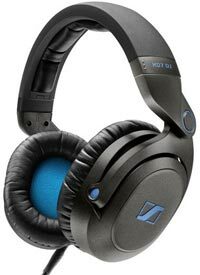 It’s your headphones that will deliver the sound and if they are one of those crappy $15 no-names, you won’t be able to experience the full richness and depth of sound and enjoy your playing as much. A good pair of headphones, on the other hand, will provide a clear and detailed sound that onboard speakers cannot offer. You can find a detailed guide on how to choose the best headphones for your digital piano here. Alright, you’ve bought a digital piano, but you need to sit on something, right? Luckily, it’s not much of a problem to find the right bench for a digital piano. There’re a variety of options available on the market today, so it’s relatively easy to find the one that catches your eye and fits your budget. The price of a bench varies from about $20 up to $60+ depending on the type, brand name, and materials used. A keyboard amp usually consists of a powered amp and a speaker, which are designed to provide a more powerful and higher-quality sound with better bass response compared to onboard speakers. Amps are quite versatile and can be used in a variety of situations, starting from a small band rehearsal and ending with big performances and live events. There’re a few things you need to consider before buying a keyboard amplifier including portability, watts, channels, extra features, inputs & outputs, etc. For more detailed information, check out this guide. If your home isn’t the only place where you’re going to use your piano, you should definitely consider buying a keyboard bag to protect your instrument during transportation and to make it easier to carry it around. Some manufacturers offer their own branded keyboard bags, other don’t, and in that case, you still have plenty of options from other trusted brands like Gator, Kaces, etc. For light travel, you don’t actually need those sturdy plastic cases that are actually quite expensive, but if you’re traveling by plane or train, I don’t recommend doing that without using one of those cases. For travel by car, you’ll probably be better off with something more lightweight and less expensive. When it comes to buying a digital piano, there are two ways you can go – order online or buy in a physical store. Both have their advantages and disadvantages. While I always recommend playing a digital piano in person to make sure that YOU like how it sounds and feels, it’s not always possible. Let’s look at each option in more detail so you can decide which one is more suitable for you. Despite a strong competitor in the form of online retailers, brick and mortar stores remain the most popular place to buy musical instruments, and digital pianos in particular. 1) You can try out the instrument in person and find out what you like or don’t like about it. 2) It’s much easier to make a decision and be confident about it when you have actually played the piano you’re going to buy. 3) Personalized attention from sales staff. You can get a recommendation from a sale’s person for your particular situation (needs, experience) as well as a demonstration of how the instrument sounds from a listener’s perspective. 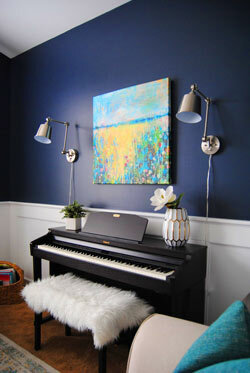 4) You can immediately pick up your piano without having to wait for delivery. 1) A sale’s person influences your decision and can talk you into buying a piano you’re hesitant about or not in love with. 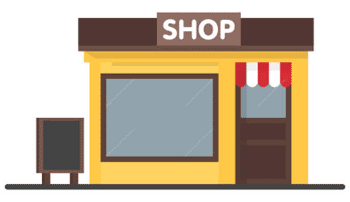 2) Prices in physical stores tend to be higher than online, especially if it’s a small local store. Online sales of musical instruments are growing each year, and people are definitely much more confident buying a digital piano online today than, say, 5 years ago. And it’s actually not surprising considering the multiple advantages of buying online. 2) Convenience of shopping at home, open 24/7. 3) A wide range of models available. 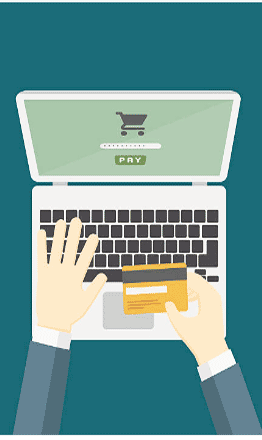 Almost any digital piano or keyboard can be purchased online. 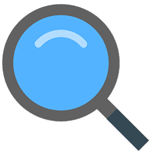 4) Easy to access consumer & expert reviews, forum discussions and video demonstrations, which are more trustworthy sources of information than an opinion of a sale’s person. 5) No pressure. You can take your time and weight all the pros and cons and make a well thought-out decision, avoiding the salesperson influence. 7) The “price + shipping (usually free)” price is usually lower compared to offline stores. 8) If you have some issues with the piano and it’s still under warranty, you don’t need to bring it back to the store you bought it from. In most cases, an online retailer will collect, repair, and return the piano to you free of charge. 2) Delayed delivery. You don’t get your piano immediately (usually takes 2-5 days), and in some cases, delivery can be delayed. 3) Security risk (payment fraud, personal information). That’s why I recommend using only well-known reliable websites. Prices on digital pianos rarely differ from one online retailer to another, except when an item is on sale. This giant doesn’t need an introduction. Being one of the largest online retailers in the world, Amazon provides a wide selection of keyboards and digital pianos with special discounts and bundle deals (more discounts and next-day delivery is available for Prime Members). These 3 online retailers are owned by one company and offer very similar if not identical products and prices. Even the websites seem to work on the same (slightly modified) platform. It’s the largest and the most well-known chain of musical instrument retailers in the world. Free Shipping applies to most orders shipped within the 48 contiguous U.S. states & D.C.
Price Match. See a better price? They’ll match any verified price from any authorized U.S. dealer for the identical new item up to 45 days after purchase. 45-day return policy. If you’re not 100% happy with your purchase, send it back. You’ve got up to 45 days. No hassles. The largest selection of music gear in the world. Over 1,700,000 items in stock and ready to ship. There are two online retailers that I absolutely recommend for those who live in UK, Europe, and other countries. Do I absolutely need 88 keys? I’d say yes unless you’re a gigging musician and portability matters a lot to you. Even though, 73 or 76 keys are enough to play most musical pieces, as you progress you’ll probably want to have all 88 keys, especially if you’re going to play a lot of classical pieces. Most digital pianos have 88 keys. Do I need all 3 piano pedals? The sustain pedal is the most used pedal on a piano and a must for everyone, including beginners. The other two pedals (soft and sostenuto) are used much more rarely and not essential. If you’re a beginner to intermediate player, you probably won’t use them anyway. Still, these pedals are occasionally used in some classical pieces, but it’s usually more advanced repertoire. So if you’re an experienced player you probably already know if you need them or not. Does my digital piano need to be tuned? 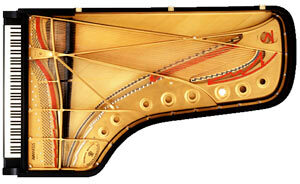 Digital pianos never need tuning because they play back recorded sounds (samples) of a perfectly tuned acoustic piano. Acoustic pianos should be tuned at least once a year, which will cost you about $80 – $100. Can I adjust the volume of my digital piano? Yes, all digital pianos and keyboards allow you to adjust the volume, which is very useful. Can I connect headphones and practice in silence? Yes, absolutely, and it’s the main advantages of digital instruments. You can hook up some headphones to your digital piano and play at any time without bothering anyone else. Today, you probably won’t be able to find a digital piano or keyboard that doesn’t have a headphone jack. Can I record what I play? Yes, most $500+ digital pianos have a built-in MIDI-sequencer that will allow you to record your performance and play it back. Some digital pianos have multi-track recorder, which means you can record several parts independently and then play them back as a single song. How much polyphony do I need? I do recommend having at least 64 notes of polyphony for piano playing and 128 notes if you’re going to layer multiple sounds and use several backing tracks in your performances. How much speaker wattage do I need? While more powerful speakers do allow for a fuller and bolder sound, I wouldn’t get too carried away with this characteristic. 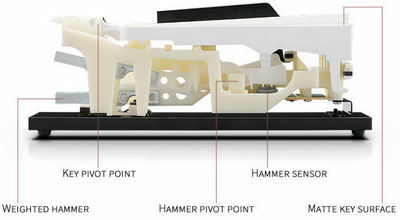 More output power doesn’t necessarily mean better sound, but it does increase the capacity of the speakers so to speak. When it comes to speakers, there’re other important aspects that add to the ultimate sound you hear including the quality of the speakers themselves, how many of speakers there are and where they’re placed, your acoustic environments, etc. Do wooden keys make a difference? You’ll find that some more expensive digital pianos ($2000+) have real wooden keys. Some claim they feel more realistic than plastic keys but as long as the weight of the key provides the same resistance of that of an acoustic piano it actually shouldn’t matter what they are made of. What are the basic things I should look for in a digital piano? Depending on your needs you may also want it to have USB-MIDI connectivity, onboard MIDI-recorder, built-in songs and other extra features. How do digital pianos differ from one manufacturer to another? You may wonder why there are so many manufacturers and models of digital pianos. Well, not all digital pianos are created equal, and although they all aim to mimic a traditional piano, it’s easier said than done. As a general rule, the more money you spend, the more realistic sound and feel you get. Manufacturers develop their own technologies, which they use in the process of sound recording/modeling, as well as when designing the keyboard action, speaker system, and all the features that come with the piano. That’s why the sound and feel of digital pianos differ from one brand to another. I can’t believe the effort you toke to create this post. It is the ultimate Bible for non acoustic piano buyers. Thanks for sharing all this knowledge. I’d love to hear your opinion about the casio px 560m as an option instead of the marvellous casio px870. If the “acustic” experience with the px560m is similar to the px870, i wouldn’t mind to buy the stand separately and get all the fun that goes with it. I have tried the yamaha gdx660 in the store but the keys are far from a real piano on it. Hi Jesus, thanks for the kind words! Indeed, I’ve put a lot of work into it, and I’m glad to hear it has been helpful to you. Yeah, the PX-560 is great. In fact, it’s the most advanced model in the Privia line and a solid choice if you want an instrument not just for piano playing. The PX-560 is very similar to the PX-870 as far as piano playing goes, but the PX-870 does have an upgraded piano sound and better onboard speakers, which results in a slightly better piano playing expirience. On the other hand, the PX-870 is nowhere near as good as the PX-560 is terms of all the extra features that come with it. I talk about the PX-560 in a bit more detail here (comparison with the CGP700). Hi, Thanks for this Post, This has been very helpful. I am trying to by something under $300 as I am beginner and I am not sure if I am going to stick to it for long for sure. I was leaning towards YPG 235 but it looks like EW300 is also a similar one . not sure which one to choose and which one is better as I don t have much idea to it except for the semi weighted Keys etc, my concern is if I buy YPG235 will it support modern connectivity features as the latest models does ( I am not sure how much important that is down the row for learning). Kindly provide a suggestion, I am open to other brands/Models as well with in $300 range. Thanks! Hi Yuvi, thanks for your comment! I don’t think connectivity will be an issue with either of these keyboards. 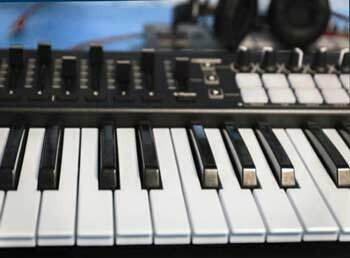 In fact, most portable keyboards and digital pianos today have all the main connectors including a headphone jack, sustain jack and USB to Host port, which will be enough for most players, not just beginners. The reason why the EW300 might not be the best choice is that it has synth type keys, while the YPG-235 has semi-weighted keys, which will feel slightly heavier and more realistic than the EW300’s. In this price range the Yamaha YPG-235 and the Casio WK-245 provide the most value for the money, in my opinion. If piano is your focus and you don’t care much about extra sounds/features, I’d also recommend taking a look at the Yamaha NP-32, to me, it would be the optimal choice for piano playing at this price point. And if you’re ready to stretch your budget just a little bit, I encourage you to check out the Alesis Coda Pro, which has hammer action keys, great piano sound, and 128-note polyphony. So overall it will provide a considerably more realistic playing experience than the keyboards I mentioned above. More info about the Coda Pro and other good digital pianos under $500 here. I was checking online for digital piano reviews and came across your review, and I most say it was very comprehensive, thank you for sharing it. I bought a used Yamaha DGX640 but noticed after playing it for a while that the keys make a noise when played as you described in your review. I usually use headphones to avoid hearing the noise and have started to consider purchasing another piano. What do you think of the Alesis Coda Pro? I have never played it but have seen online reviews of it on YouTube, I will like your opinion of it. Thanks! It’s a fine keyboard for a beginner. If you’re a more seasoned player, I’d recommend sticking with brands like Roland, Yamaha, Kawai. 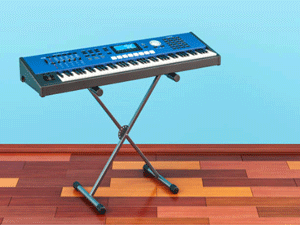 Take a look at the Roland FP-30, Yamaha P-125, and Kawai ES-110. Thanks, Great information. My oldest son, 14, liked the Roland FP-50 the best of the limited electric pianos he has tried so far (he has yet to try the FP-30). 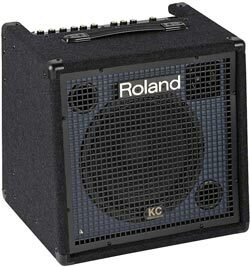 I did listen to a Roland FP-30 and it did sound very good to me from the built in speakers. We do have a medium grand at home and I’m looking for a keyboard so both boys can practice at the same time and for a unit we can bring on extended trips for practice and for small local performances. 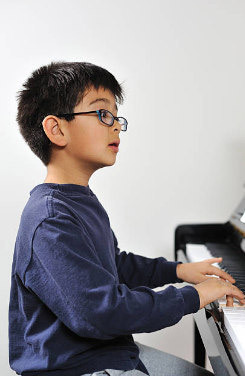 My boys are quite advanced, my oldest plays chamber music at a local university program, and I was wondering if it would be worth looking into a Nord Piano 3. Yes, you need external speakers, but does it really give you significantly better sound and action compared to a Roland FP-30 for an advanced kid? I have yet to find a Nord Piano 3 in a local store to try out. Hi Karl, well these are two quite different instruments you’re comparing here. The Nord Piano 3 although focuses on providing an authentic piano experience, it’s a performance-oriented piano. It has no built-in speakers and has various knobs for changing sound effects on the fly, which is very handy for a performer. It wouldn’t be very fair to compare it to the entry-level FP-30, which cost four times less than the Nord. But if you’re looking for a realistic piano playing experience, there’re much more realistic keyboards than the Nord Piano 3 in this price range. I’d recommend taking a look at the Kawai ES8 and the Roland FP-90, which are currently the best digital pianos under $2000 on the market. With a $3000 price tag, the Nord Piano 3 won’t give you a better sound or feel than those two keyboards, but for gigs, it would be a very nice option since it’s lighter and smaller than the other two. You also mentioned the FP-50, which is also a very capable instrument, but there’s actually a newer model called the FP-60, which was released just a few months ago and replaced the FP-50. You’ll hardly find more realistic portable digital pianos in these price ranges. Fantastic site. Thank you for all of the time and thought you’ve put into this. Always nice to read someone else’s thoughts/experiences, especially when they’re well-communicated. Question for you: do you have a “Top 10 list” somewhere on your site? When I click on Top 5 – Intermediate, it takes me to “Best Pianos for Under $1000/$800” and not an Intermediate list. I’m willing to pay up to $1500 for a nice digital piano for home playing/practicing and would love your opinion as to which 1 or 2 I should look at. Sounds like the Korg G1 Air may be your #1 pick, but please let me know your thoughts in the $1000-$2000 (or $1.5K) price range. Hey Andy, I’m glad you enjoyed reading the site. For now, I only have 3 “top list” articles. Since price usually correlates with the level of player the keyboard is intended for, I decided not to create a separate list for, say, intermediate players, because it would contain the same instruments as the “Best under $800” list. There is actually no strict division into “levels”, and these terms are mostly used to help people understand at which segment/price range to look at depending on their level of experience. People use different criteria when looking for a digital piano. Some people doing their research depending on the price, others on their level of experience, some are looking for a particular type of digital pianos (portable, console, stage). So in order to not duplicate my articles (strictly saying) and write about every type, every price range, and every level separately, I try to combine at least two criteria in each article, since they often correlate with each other. For example, the “6 Best Digital Pianos Under $800 for Intermediate Players” article combines price and level factor. The “5 Best Digital Pianos Under $1000 for Home Use” combines price and type factor. That’s why you when you clicked on Intermediate in the menu you saw two articles “Under $800” and “Under $1000“. Both articles list best digital pianos intended for intermediate players. But while the “Under 800” article list mainly portable digital pianos, the “Under 1000” lists console digital pianos intended for home use. In the future, I also plan to make lists for advanced players, and $1000-2000 price range. Only issue, why not give physically modeled piano sounds some love in this article? Hi Pete, thanks for your suggestion! Yeah physical modeling definitely deserves to be in the article, will add it ASAP! Hi, thank you so much for the reviews. It is very helpful in guiding me to learn more about digital pianos and be able to make a wiser decision. I am mainly thinking between KDP 110, ROLAND RP-102 and CASIO PX-870. I understand the price range is quite different and KDP is about $300 more expensive than CASIO PX 870at least in nearby stores where I live but I want to choose the best digital piano below $2000 and $300 is not a big deal in my opinion and I am only going to use the piano sound not other features. So considering that, which one would you recommend the most? and thank you so much for sharing your expertise. Hey there, you’ve picked really good instruments, so regardless of what you choose you’ll be happy with any of these. My personal pick would probably be the Kawai, although the RP-102 is also a very successful model, in my opinion. I’d choose the RP-102 for the action, KDP-110 for the sound, and Casio for overall price/value ratio. Hi Lucas, thank you very much for all the useful information here. I have an acoustic piano at home but as I’m now a college student I’m looking for a good and affordable digital piano.I’ve done a lil bit research and found Yamaha p45 and Roland Go Piano.I’d love to hear your opinion on both pianos as I’m looking for a good and if possible under $500 and I’m open to your suggestions. Thanks so much!! Hey Grace, if you’re looking for as much authentic experience as possible, look for keyboards that have fully-weighted keys. Roland Go Piano is not one of them. Within your budget, I’d recommend taking a look at the Yamaha P-45, Casio PX-160, and if could stretch your budget a little bit, I’d encourage you to consider the Roland FP-30 and Kawai ES-110 which I think overall provide a more realistic playing experience in terms of piano sound and feel. Lucas, this is the best site ever!! good job! Thank you for your realy helpful post. I’m sure this is the most accurate guide on the internet. Anyway, I have a realy low budget that Yamaha p-45 is considered realy expensive for me, And I’m so much into classical music that I can’t stop thinking about it! I’m also looking for a digital piano that can meet my needs forever! (literaly)!!! I only want to play for fun. I will never choose “music-related” jobs for a living! Is Yamaha p-45 enough for my whole life?!!!!!! Seeing that i can use a VST while playing, whenever I wanted a more accurate sound, or String Resonance. How about roland fp-30? It has String Resonance, even if it’s way more expensive…but I think maybe the metalic sound does’t fit to classical music. I’ve been playing on a too-cheap, fake 61 keyboard for about 2 monthes(non-weighted keys, no velocity control, sound decay: less than 1 sec! ), that’s why I’m realy scared about p-45. I don’t know if it’s enough or not. I’m gonna use a lot of reverb, but only mellow piano sound and no aditional features. Hey, even though digital pianos last for quite a long time, it’s very unlikely that you’ll be playing one instrument for your whole life. Inevitably, there will be some mechanical wear, keys will become clunkier and noisier over time, so you’ll want to get an upgrade, especially considering how fast technologies are evolving nowadays. Between the Yamaha P-45 and Roland FP-30, I’d definitely pick Roland. It has a much better keyboard, richer, more realistic sound, and some nice features like Bluetooth, WAV/MIDI playback, etc. The sound of the FP-30 can hardly be called metallic, the instrument will handle classical music just fine. Plus, you can always make the sound “less metallic” by adjusting Brilliance. Thank you so much for the wonderful info in this article. I have always had an acoustic piano, the last one for about 45 years. Since I was planning to move into a condo, I was concerned about possibly having to move it into a second story dwelling. I also felt that I should have the ability to use headphones out of consideration of possible neighbors. It was harder to sell my piano than to sell the home my children grew up in! As a music teacher, I have always been impressed with Yamaha’s quality and consistency. I’m interested in a portable digital piano with a sound that is as close to acoustic as I can get. I’ve looked at the DGX-660 and decided it has many more bells and whistles than I want or need. I’ve looked at the P125 and the P255. I’m not sure the P125 offers all I want, and I’m not sure I want to spend the $ for the P255. Whichever way I end up going, I truly appreciate the knowledge you’ve shared. If you have any additional thoughts or recommendations, I’d love to hear them. Many thanks! Ivamae, thank you for the kind words! Since you have a lot of experience and want to get an instrument that feels and sound as realistic as possible, I’d encourage you to take a look at the Kawai ES8 and Roland FP-90, if you don’t mind investing $1500+ in an instrument like this. If you’re on a tighter budget, definitely take a look at the Kawai ES110, Roland FP-30, and Yamaha P-125 that you’ve already mentioned. As for the P-255, there’s an updated version of this model called P-515. I’m going to do a review of P-515 soon. Thanks for the very helpful guide. I’m wondering if there’s any digital piano console model for the home that also allows the keyboard to be removed easily, so that it can be used at another location temporarily? Hi Norm, usually console digital pianos come with a wooden stand that supports the keyboard, which makes it trickier to move around (you’ll need to unscrew the keyboard and remove it from the stand, but they’re not supposed to be used without their “body”). On the other hand, a lot of portable digital pianos are easily transportable, and in most cases, you can separately buy a furniture-style wooden stand designed just for that particular model, which in your case would probably be a better option. Thanks for this post but i was wondering if you had a sub $400 digital piano that had full weighted keys? Sure, check out this guide, all digital pianos listed there are fully-weighted and budget friendly. I particularly recommend taking a look at the Casio Privia PX-160. Hope this helps. So in depth! Great 🙂 Is a digital piano a fit for a beginner? Hi Elaine, of course! In fact, I always recommend getting a proper digital piano with fully-weighted keyboard for all of my students (including those who are just starting out). Thanks for the helpful guide. I’m wondering about a new piano KURZWEIL SP1. I looked at their Vivo H7 and from the specs it looks very interesting. Any plans to include this new company in your reviews? Hey Andreas, thanks for the suggestion! Yeah, I heard some good things about Dexibell instruments, though they seem pretty expensive, and with Fatar action I’m not fully convinced they are worth their price tag. Anyway, I should definitely try them out and talk about them in more detail, so I’ll make sure to put them on my list. Hey Ramses, personally, I’d probably choose the Casio. But it doesn’t matter because you might have a different opinion after playing them side by side, which I recommend you do. Both are great instruments though, especially for beginner/intermediate players. Also check out my comparison on these two here and here. Thank you so much for this review. It helps a lot. The one thing I didn’t see covered is a general “life span” of a console digital piano. My used upright lasted over 30 years. What can I expect from a digital and what are things that can go wrong which can or cannot be fixed? Hi Gracelyn, appreciate your comment! I’ve just added this to the guide. Here is the link or just add #lifespan to the URL of this page. I hope this helps. Thank you. This is exactly what I needed to learn. I appreciate your help. You’re very welcome, Gracelyn, that’s exactly what this guide was missing. So thank you! I will buy a piano with the pitch bend and modulation wheel. I´m thinking about Privia 560 or Kurzweil SP1. Could you suggest which the best is? While I haven’t played the SP1, I’d still go with the Casio. To be honest, not a big fan of Kurzweil lower end digital pianos (their key actions in particular), so I may be a little biased here but who knows maybe the SP1 will prove me wrong. Hey Stephanie, my personal choice would probably be the Roland F-140R, but it’s hard to give any specific recommendations, since people have different tastes, background, etc. I really like the rich, resonant tone of Roland digital pianos, the PHA-4 Standard action is also very good, especially considering the price. The PX-870 would be a very close runner-up with a lot of options to adjust the sound (resonance, acoustic noises, etc. ), beautiful piano tones, and a fairly realistic keyboard. It also offers the most features of the three. The Yamaha YDP-163 is although a good instrument, in my opinion, it’s a bit overpriced. The GH3 action is very good and arguably the best of the three, but as for the rest, it doesn’t really offer anything ground-breaking. It shares the same sound engine, features, and connectivity options as the YDP-143, and to me, the 400$ difference is not entirely worth it. But that’s just my opinion, and the choice is always yours. It’s always a good idea to go to a music store and play these three pianos side by side to see which one clicks with you. Wonderful site. Thank you for your time and generosity it preparing all this. Am considering a replacement for my Yamaha acoustic as I live with an open plan living area and really have stopped practising out of consideration for others. I am prepared to splash out a bit, I don’t need lots of bells and whistles but would prefer something with as authentic a sound as possible. Do you have any suggestions for a better quality, weighted hammers, digital keyboard? Hey Gail, there’re so many options on the market, so it’s difficult to give you any suggestions without knowing your budget. Since you’ve been playing an acoustic piano all the time, and the only issue you had is the inability to practice without bothering others around you, you could take a look at the hybrid acoustic pianos (e.g. Yamaha Silent Piano series, Yamaha TransAcoustic, Kawai K300 AURES, Kawai K200-ATX3), which will have real strings and hammers but also an option to plug in a pair of headphones and practice silently (the sound will be digital in that case). These types of pianos can be quite expensive but are very convenient and will provide you with the most realistic playing experience (they’re basically acoustic pianos with digital features). I’m tall (6′-2″) and have concerns of whether I’d fit/align properly on consoles such as the PX-870, KDP110, G1-Air, F-140R, or YDP-163. When I sat at a YDP-143 and a PX-870 recently (only store consoles near me), the top of my legs were contacting the underside of the key bed. I’m a newbie, so my seated position may not have been perfect, but I believe it was close. 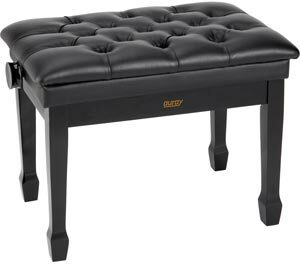 Also, an adjustable bench might help somewhat but I still question if it would be enough for adequate leg clearance and proper foot/heel to pedal placement. All things considered, would a portable DP on an X or Z stand make more sense than a console for a tall person like me? It seems it would provide the most adjustment for functional comfort (keyboard height, seated position, pedal position). If so, what are you thoughts on the P-515 in comparison to the ES8 and FP90 (which I read your reviews on)? Thank you again for your time and expert reviews and advice. Greatly appreciated! Hi Craig, I think adjustable bench should do, but it’s hard to tell for sure unless you sit down and try. 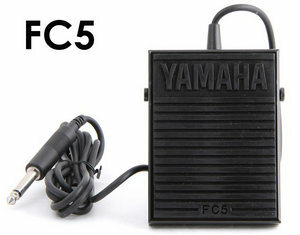 As for how the Yamaha P-515 compares to the ES8 and FP-90, check out my review of the P-515 here. As a relatively new Piano player (formar guitar player and I played a small bits of synthesizer as a kid), I now want to invest full time in learning Piano & Music theory / reading (I played guitar as tabs player and I regret not having more theoretical knowledge). However as I currently live in an apartment and I can’t get a standup yet (room, i need to practice with headphones for now), I’m looking for a digital piano (going to both teach myself with book and a teacher). Unlike the mistake I made with a guitar, I want to grab a decent one right away instead of learning on a bad one, and then having to re-learn certain stuff on a good one. I’ve set aside a budget of +- 1600 euro. For now I’d play with headphones and the piano resting on my large desk (not even an Z stand for now). Eventually I’d potentially look at incorporating it into a proper stand (furniture like). What would you recommend to go with to be safe for the coming years? I’ve read so many good things about the Kawai ES8 in terms of key action and overall sound. As the price dropped and it’s now at a respectable 1300 euro at Thomann for example, this seems like a really good option? How would it compare to the Yamaha P515 (slightly more expensive) please? I have been looking for a piano for sale to put in my house. I am leaning towards a digital one so that it will be lighter. It is also good to know that the digital piano is often cheaper. Thank you so much for all the effort and time and I can only imagine the expense! I do appreciate it though and I have been leaning towards the Casio PX-770 but have looked a lot at the px-160 and the Yamaha P45 & P125. So many choices! !